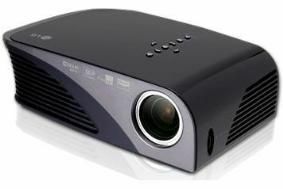 LG 's portable HS200 LED projector delivers 120in image | What Hi-Fi? It's equipped with LG's Twin XD Engine and has a claimed contrast ratio of 2000:1. As it's fitted with an LED bulb, it uses less power than a standard projector and shouldn't need the bulb replacing during its lifetime, says LG. Resolution is 800 x 600, it has USB, RGB and HDMI connections plus conventional phono ins and outs. There are built-in virtual Dolby speakers and it has FM wireless audio. The fixed zoom lens uses manual focussing, and delivers images in 4:3 aspect ratio. JPEG images can be displayed via the USB connection, which can also be used for playback of DiVX and MP3 files from an external hard disk. The LG HS200 will be available from October 2009, for around £500.